I think I got it now. I think. I refuse to disregard because it reminds of several flights I made in and around sunset. Last flight of the day usually. One evening I dropped my last load through a hole that conveniently opened up......ahem. The undercast looked solid and it was coloured by the setting sun, a pinkish, orange colour. It was entrancing and alien. I dived down into the cloud canyons and joyfully zoomed through the fluffy valleys until my reverie was interrupted by ground wondering where the hell I was. But I was in heaven. I dived through the cloud and emerged into the grey reality beneath. I bought a bottle of wine on the way home and. drank it all myself in celebration of a most magical moment. I now dislike flying but it provided some magical moments. Well, what a lovely picture Beth and simply wonderful moments described by you Marie, it must truly have been like heaven. I am in awe, Marie..... to get to imagine moments like that is why flight simulation appeals to me so. This screencap was taken on a clear, cold morning headed down the Columbia River (Oregon side) toward the city of Hood River. It was heaven, Celia. But heaven is fleeting. Of all the hours in the air only a few remain in my memory. Like circling a heavy shower. A giant bestriding the sky. My little bird was like a fly to an elephant and it would squash me the same way. Seeing a rainbow from above, a full circle. I commented that. 'We're somewhere over the rainbow'. Or looking down and seeing what appeared to be millions of tiny silver fish shooting across the sky. It was rain falling beneath us. Surreal. Most of all a sense of being separated from the Earth, alone in a way very few experience. Above about two thousand feet people vanish, only their mark on the landscape remains. I was often reluctant to land. Incidentally Kaibeth, a similar style photo is pinned to my kitchen cabinet. Only it's early morning and we're flying to my local airport in formation. It was a bright morning as we approached the coast and bay. The city beyond was smothered in a fog bank. Someone in the trailing aeroplane took a photo of the one I was flying, set against this beautiful background. It was a fleeting moment. I'd post it but it would out me in the most public way. Flying was an escape for me. Beth, I like your images. In my guy days (1990s), I made the airlines' mileage clubs several times, one year rounding up 75,000+ miles. I would typically fly midnight east because, of course, the day becomes longer. On a couple of flights we would skirt thunderstorms and if I had a window seat and with the cabin lights very dim, I would look out and see these really weird lights on the top of the storm clouds. 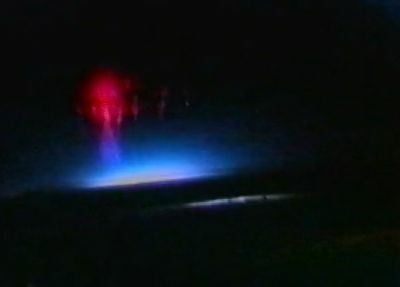 They are called blue jets and red sprites. The blue jets are just at the top of the clouds and the red sprites, which are harder to see because of the planes windows are higher above the clouds. But they are beautiful, much like the Northern Lights (which I have not seen, damn!). 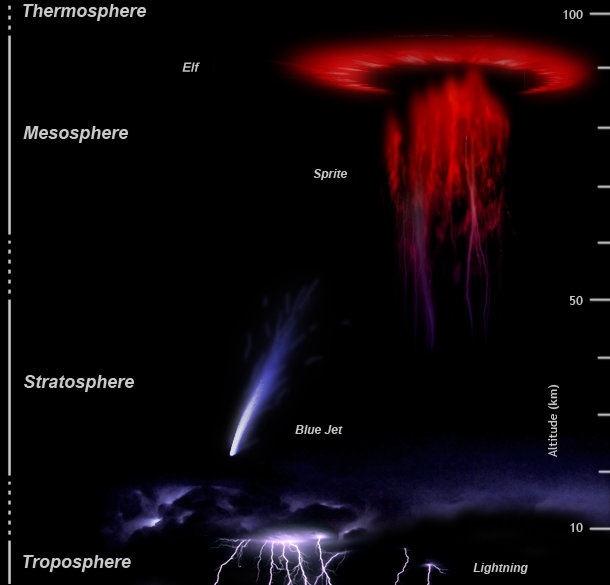 There is another lightning effect above the red sprites are a red halo called elves. Even the atmospheric scientists didn't believe those early pilot sightings but now they do. My flights may be fake, but my passion for aviation is very real. Marie, you are making me wish I could fly for real even more with your stories. Glad to listen to any you wish to share. Michaela, that's astounding. I have never heard of those. My sim sure doesn't emulate them. Kaibeth wrote: My sim sure doesn't emulate them. Those sprite phenomena are amazing! The Northern Lights I have seen a few times in Norway and they appear in many different types of splendour from pure white flashes dancing across the sky to a host of wonderful colours. I have viewed the white shimmer bands of swirl in England a couple of times, it can be viewed anywhere in the UK but the further south the rarer of course and light pollution prevents it from being seen in large cities, though not impossible. I have seen the amazing swirling and dancing purples, blues and reds and blues and greens in Norway and believe me they are quite amazing and memorizing, something everyone should see in their lifetime. I regularly simulate Southwest Airlines flights. I get pretty up there. I also nightly fly at Flight Level 420, if you take my meaning. Kaibeth wrote: I regularly simulate Southwest Airlines flights. I get pretty up there. The only Southwest flights i would take would be from SJC to SNA, PHX or SAN, Those would be daylight flights and those flights were typically at 380 in a very crowded 737 and I would always spend the extra $20 so I could take an upfront aisle seat so I could get off those planes quickly. I don't fly anymore as I am very susceptible to any bug someone has on board. I've not been on anything resembling an airliner since coming home from Korea in 1987. Been up in a Cessna 172, however. N20262. I had her controls for about an hour. I've only been on jet planes, never a light aircratft and I am sure I have written before about how unlucky, or lucky I am maybe.... on flights. I have had flights cancelled and once ended up in a Japanese hotel miles from Narita, not knowing anyone or where the hell I was! The TV was all in Japanese and the bar empty so the fridge bar was emptied and then an early night! I've had my luggage lost lots. Once flying into Malta the wings got tipped by a crosswind yards off the runway and I thought it was me, I was very scared but when the plane landed safely everyone clapped and cheered!!!! Then coming into Heathrow once, I could see the runway and the plane lifted off again!!!!! No explanation was given apart from a call from the Captain saying we'd be delayed. Then there are the two heart attacks, no not mine. The first going to Cyprus and a very large man was given CPR by crew, a Doctor and I went to help too. The plane took quite a descent and slapped down on the runway in Ancona, but it was not Ancona airport, it was an Italian airbase and soon Italian air force personel with lots of scrambled egg and machine guns paced up and down the plane. Then the paramedics arrived, they pronounced him dead after taking over. Then we had to wait for the coroner. We were delayed for many hours. Heart attack two occurred over Austria and the plane did the same, it nose dived and landed, gentlier, in Vienna and we were delayed no less than ten hours!!!!!! Don't fly with me. But! When I was about 18, I was offered a flight in a glider at High Wycombe by a guy. I accepted and sat in the front of it with him behind. A plane towed us up and I was frit rigid for around half an hour that seemed like ten hours!!!! After the eternity, he asked if I wanted to take control and I declined, probably very nervously, so he told me he was going to land...… well,.... the wings suddenly started shuddering and probably did not move much, but to me they were violently swaying back and forth! It was very noisy after only having the sound of the wind! I was totally distraught. I think he sensed my panic and explained about the air brakes and told me to look at the wings.... I opened my eyes to view well, two lumps of wood is my best description, that came up out of the wing! Anyway, it was something I'll never forget. He did ask if I'd like another fly a few wekks later..... I get a little frit on the big planes, but the little glider was half an hour of sheer purgatory for me! Ah yes Celia, typical non flyer tales. Apart from the heart attacks. Now that's where I would fall apart and end up in a quivering mess. Your glider experience is typical. Gliders have flexible wings so they flop up and down. Perfectly normal. If they stop moving you're in trouble. Actually it's quite difficult to get killed in a glider and even a light aircraft. I remember flying along just after we heard that a young military pilot had crashed and burned in the military version of the aeroplane we were in. My Brummie Instructor commented that it was difficult to get yourself killed in one of these. In fact it turned out the kid's last words was in fact a text message. 'Watch this' to his buddies he'd just dropped off. Whatever stunt he pulled it was spectacular and fatal. A friend, an army medic was one of first on the scene and pulled his burning body from the wreckage. The point is that it's only dangerous when you do something stupid. I lost three friends in two plane crashes, both were silly preventable accidents. But lessons were learned. As for your Heathrow go around, Celia. They're more common than you think and in fact are indicative of how safe flying is. I've no idea how many I've many I've made myself. But only one in an airliner. Flying into Madrid already late and worried about missing my connection. We went around very late. I expressed irritation only to realise that it scared the woman beside me. I apologised and explained the go around was probably due to an aircraft ahead being slow to clear the runway. The pilot announced the same thing and my credibility soared. I did miss my connection though. It always amazes me how little people know of the nuts and bolts of airline flying considering how often people fly these days. But it really is safer than the drive to the airport. Yes, vastly prefer to go around as to have a bad landing situation. Airliners have all that nice info ready-to-go in case of a situation. Perfectly normal, as Marie said, and very much safety-enhancing. Just downloaded an android app, Airline Commander, it's a freemium game. So you need money to progress but it's fun and surprisingly realistic. Although the landing is botched. If you flare to land you get a bad landing but if you drive it in nose first it's a good landing. Daft! On one real flight while climbing to altitude. I opened a flight simulator app. I turned to the gang in back and told them I had linked the phone to the controls. I tilted the phone and the little aeroplane on the phone banked to the right, so did the real thing. Then left and we banked left. As I had both hands on the phone I had them convinced. Of course I was was using the rudder pedals which they couldn't see. It was a joke but actually not implausible. One aircraft I saw had a space for a tablet which was integral to aircraft. If you seek a decent flight sim for devices such as phones or iPads, check out "X-Plane 10." It just nagged me now with some gamertag crap I didn't know it did, so, I can warn you about that. Anyway, it's free, and made by the people that make my main sim. And it has a 172 and a CirrusJet as free planes. And has other aircraft available for nickel-and-diming you. $0.99 to $4.99 per bird. It has maybe five airports to fly out of, customizable weather, failures simulation and the like. Not bad for a crappy cell-phone app. When I get a hankering to fly in a long wait at the doctor's or some such, it's a pleasant diversion, to me anyway. Some I couldn't repeat. But loads of banter. Sometimes the guys would bring up the reason why I was thrown out of the air force. I told them not to mention the incident at 'Macho Grande'. Once though in the middle of it all, one young guy piped up. He just said, 'You guys have the best job in the world'. That shut us up. He was right. In that moment we did. But it isn't really. I don't miss it much.